The second semester of 1st year Calculus is the preparatory course for all of the 2nd year courses (Multivariable Calculus, Differential Equations, Linear Algebra). Often referred to as "the first course on integral calculus", Calculus II focuses on a more practical, computational command of the integral, which is only introduced as a concept in Calculus I. When you (or a computer) can algebraically integrate a function, how is that accomplished? Essentially, the Rules of Differentiation are "inverted" to the integral, providing the main strategies for attacking the algebraic integral - when possible. The vast majority of functions cannot be algebraically integrated - there just is no algebraic antiderivative for such functions. The development of "Plan B" for attacking these types of algebraic integrals comes in the form of expanding the way we describe functions, not just with the elementary class of functions including such friends as sin(x), ex, x1/2, etc. but with a more generalized description based upon infinite polynomials. This raises all kinds of questions that have to be studied, but once accomplished, we are able to conquer these algebraic integrals. 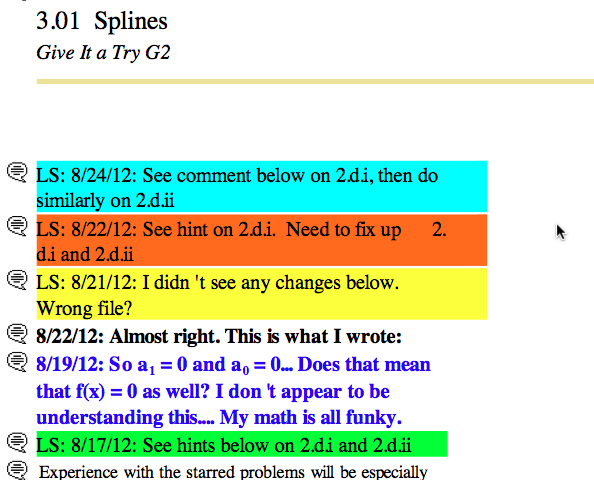 Calculus II is the longest course in the Calculus sequence. Many students feel that Calculus II is the most difficult course in the Calculus sequence as well. Calculus II starts with an intensive 40 assignment refresher of introductory integral calculus, starting from the definition of the integral via signed area, ranging to beginning algebraic integration, the Fundamental Theorem of Calculus, and initial applications of the integral. As many students start in our Calculus II course, having studied Calculus I elsewhere, it is important for all students to have this common foundation moving forward into the Calculus II course. One of the goals of Calculus II is to become an expert in algebraic integration: finding antiderivatives. Computer algebra tools can find antiderivatives automagically, so an exploration of the techniques of antiderivatives must contain an meaningful mixture of integration concepts, manual skills, and usage of computer algebra software. Traditional Calculus II courses explore these techniques purely from the paper/pencil standpoint, which has merits and drawbacks in this modern age. We strive for a balance between classical and modern computational mathematics in a unique way. For example, a more advanced integration technique known as Integration via Differentiation is presented, which is absent from all traditional textbooks, since it is computationally difficult with only manual tools - it is the leverage of computer algebra tools that makes this technique come alive. Calculus II starts the dimensional generalization of integration theory, into double (or 2D) integrals, which can be used to measure volume and other applications. Double integrals initially come in two varieties: over 2D regions that are essentially rectangular, and over 2D regions that are not rectangular, but whose boundary curve can be formulated. In the latter case, the Gauss-Green Theorem is utilized; it is common for this theorem to be explored only in Multivariable Calculus, but we do this theorem early as an introduction to the higher dimensional Fundamental Theorem of Calculus. The second half of Calculus II explores the problem: What to do when you cannot find an antiderivative to a function, like f(x) = x * tan(x) ? The limitation is not a matter of cleverness - one can prove that this function has no algebraic integral in terms of elementary functions (exponential, log, trig, roots, finite polynomial, etc.) This leads to the concept of a function polynomial expansion - a way to approximate a function by polynomials (bridging to equality when considering infinite polynomials). Moving to this new way of describing functions beyond elementary functions allows integration to be accomplished. As a result of polynomial expansions, infinite sequences and series are studied - a flipped order as found in all traditional calculus textbooks. To meet transferability requirements, Calculus II has a few introductory lessons on 3D geometry: lines, planes, vectors, dot products, cross products. Why is the Calculus II so long? Historically and nationally, it has always been so. Calculus II has the reputation of being the barrier course to 2nd year Calculus - colloquially, the "weed-em out course". One reason for so many topics is for articulation/transferability to the majority of colleges/universities in the U.S. Course Description: Further study of the integral, volume of a solid of revolution, length of a curve, area of a surface of revolution, work, moments, and centroids. Applications of differential and integral calculus to improper integrals, infinite series, polynomial approximations of functions, Taylor's Theorem, conics, polar coordinates, and vector analysis. For many students, planning for the Calculus II course is simply the natural progression from completing the Calculus I course, as part of their particular educational plan of study. An essential course for physics, engineering, and computer science students. Required course for advanced economics, finance, bio-statistics, and other math-heavy graduate degrees. One indicator of how fast a student can complete Calculus II is the grade earned in Calculus I.
Rafael is a undergraduate chemistry major, and part of his degree program dictates that he finish Calculus I and II. Rafael did pretty well in Calculus I, but wants to try something different for Calculus II, and to take the course via Distance Calculus. How fast can Rafael complete the Calculus II course? The answer to this question depends mostly on when Rafael plans to work on the course. The most successful time for Rafael would be during winter, spring, or summer breaks from his regular course load. By modifying his schedule to work on the Calculus II course during these "off times", Rafael will be able to concentrate and focus just on the Calculus II course, and his tendency towards success will increase dramatically. Kathy just got accepted into Graduate School in Economics towards a Ph.D. She has a conditional acceptance, and must finish Calculus II in a very short time. Kathy also works full time. What must Kathy do to finish Calculus II? The "short time" needs to be on the order of 4-6 weeks for Calculus II. Anything less is quite impossible. 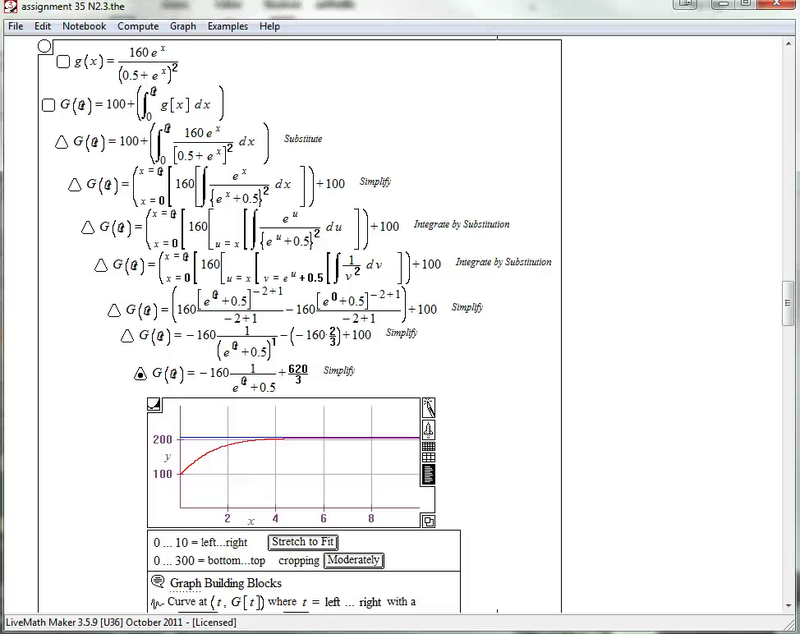 Calculus II is just too long and difficult to complete in any less time. Kathy will also need to plan to be on the C grade path - which will lower her syllabus requirement by 30%. As the graduate school only needs demonstration that the Calculus II course was completed with a grade of C or above, and this grade will not transfer to Kathy's GPA, a C grade is planned for. (If Kathy finishes her C syllabus earlier than expected, she may go back and complete the additional assignments to move back to the B or A grade paths). Kathy will need to plan for large blocks of time to dedicate towards the course. If shooting for 4 weeks completion, then at least 8-10 hours per day. If shooting for 6 weeks completion, then 6-8 hours per day, every day. It will be a very challenging 4-6 weeks. Kathy should also be ready that the course takes a little longer than the planned 6 weeks. Going a week or two over to 8 weeks is quite common. Usually graduate schools are quite understanding of the situation of "I'm almost done", and in many cases, the graduate school will give a short extension to aid the student with harsh deadlines. Kathy must understand that even though there are some tough deadlines with this plan, that does not mean that "corners are cut" in the Calculus II course because of these extenuating circumstances. There is only 1 way through the course, and that is the right way. Halley is applying to Graduate School in Biostatistics towards a Ph.D., and will start in 1 year. Halley knows she must complete Calculus II prior to starting that course work (and even before submitting the graduate school application). What will the Calculus II course look like for Halley? The typical path for students like Halley is the 8-10 week plan. Al took Calculus I and did OK in the course, earning a C grade. Then Al went onto Calculus II, hoping to improve his grades, but found Calculus II to be considerably more difficult than Calculus I, and ended up earning a D grade (or not passing). Al loathes the thought of returning to the classroom lecture for Calculus II. The lectures were not that much fun going through them the first time, and trying to sit through them a second time will be more than just painful. 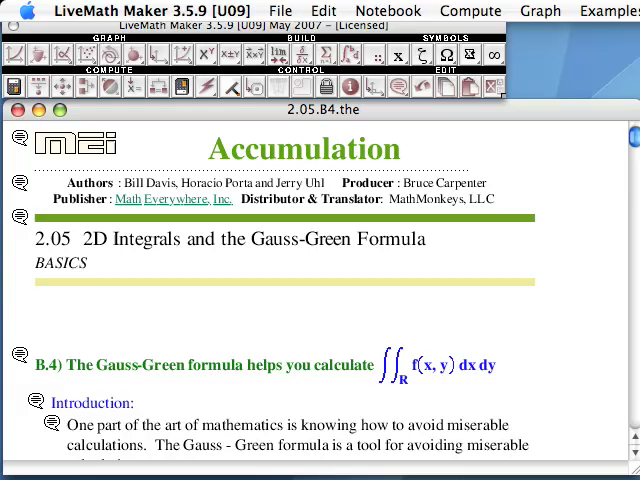 Al wants to change gears, and try something new - taking Calculus II via Distance Calculus. Typically, students like Al will take the course over the summer months, and be able to focus just on the Calculus II course, without being overwhelmed by multiple courses all vying for Al's attention. Al should plan to take a step back, a deep breath, and engage the course as if starting on a marathon race. Just because Al "had Calculus II already", this poor foundational knowledge will not help Al succeed in this second (and quite different attempt). Al would be approaching Calculus II from a completely different viewpoint than his previous attempt, which certainly goes a long way to minimizing the "review" nature of repeating a course. 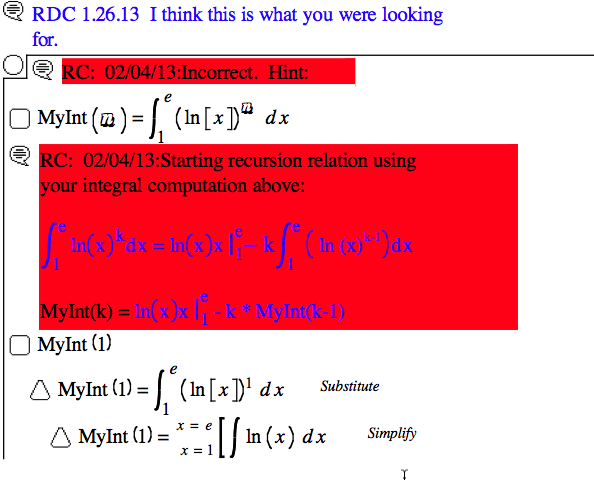 When going through the new Calculus II course, all will see things he saw before (e.g. integrals), but completely different types of questions that he probably saw in the classroom/textbook course. An open mind, and genuine academic curiousity to investigate and embrace the new style of work will be required for success. Al should plan for a minimum of 12 weeks to engage the course, even during the summer. It will take time for the course concepts and materials to "sink in" and become comfortable. We have had many students like Al succeed in Calculus II where their classroom experience with Calculus II was a failure. However, we have also had many students like Al who discover that the reason they didn't succeed in their first attempt at Calculus II was an indicator that their math skills are not strong, their interest in math is weaker, and their chosen course study plan may need to change upon failure in two different course paradigms. Anwar is a hot-shot high school student. He has completed AP Calculus AB (equivalent to Calculus I), and instead of taking the AP Calculus BC exam, he wants to jump ahead and take the Calculus II course from Distance Calculus, earn collegiate credits directly, and transfer them to his planned university (that he currently has applications out to). Anwar will most likely be able to finish the Calculus II course very quickly with a dedicated effort that is quite natural for him. 6-8 weeks is the common time frame. However, Anwar may discover that Calculus II via Distance Calculus is an adult course, and quite unlike the high school course paradigm that he has been so successful in previous. Some students like Anwar can find Calculus II more difficult than they anticipated, and they have to dedicate more time and effort than they had planned to budget for. While Anwar can earn collegiate credits for Calculus II in a similar way that AP Calculus BC would earn, Anwar would not benefit from the inflated GPA multiplier that AP courses help with high school GPAs. On the plus side, quite often schools (mostly graduate schools) will not accept AP Calculus course credit for satisfaction of program prerequisites. Some schools are starting to insist that higher courses - like Calculus II - be completed a real collegiate courses, and not "waived via AP Exam". We have seen more than a few students have to return to Distance Calculus to re-take Calculus II again as a real collegiate course, as they graduate program would not accept the AP Calculus BC exam completed in high school as proof of Calculus II completion. Over the past 16 years, Distance Calculus has enrolled thousands of students who successfully complete the Calculus II course, and use this course record towards undergraduate and graduate programs at various colleges and universities in the U.S. and throughout the world. Through the usage of a computer algebra system like LiveMath™ - you will never miss a minus sign again! Although the driving of a computer algebra system requires some up-front time to learn and master, once completed (rather quickly for most students), the time saved from having to be a "minus sign accountant" adds to the productivity of your study time. If you have ever spent hours looking for that "little numerical error", you know what we mean. Command of a computer algebra software system is a modern-day necessity of mathematical academics. It is important, however, to retain a meaningful command of paper/pen/pencil manual computations as well. Our blend of curriculum strives for an 80%/20% split between computer algebra usage and manual computation and written skills. With each module in our curriculum, a concluding Literacy Sheet assignment ensures that each student has written mathematical competency in the subject area. is rather pointless considering the technology available today; but understanding the process and strategy towards computing this antiderivative, and the inherent skills acquired that will generalize to other solution skills, is essential, and the usage of computer algebra technology allows for this study to replace time wasted on multi-page hand calculations. The proctored final exam is a written exam away from the computer. It is these Literacy Sheet assignments, and the continuing bridge from modern computer algebra software back to classical, manual mathematics that prepares the student from this written final exam. We do not have any multiple-choice work. We are a real collegiate-level course program - not a "canned" set of multiple-choice question sheets which are common from large publishers and degree-mill schools. What is a videotext? It is like a textbook, except instead of being based upon printed information, this "text" is based upon video presentations as the core method of explaining the course topics. Instead of a huge, thick 1000-page Calculus textbook to lug around in your backpack, all of this new "videotext" can be loaded into your iPods or iPhones (and soon, the iPad!). Example Videos are in MP4/H.264 format, which play in most modern browsers without additional software. When additional software is required, a backup Flash player will play the video. As a backup to Flash, you may also use iTunes and/or VLC. 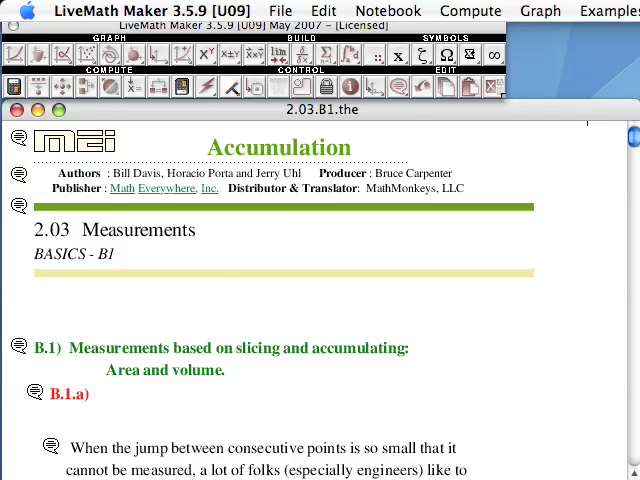 Although we are anywhere from a few miles to a few thousand miles apart, watching these screencast videos is like sitting next to the course instructor, watching his computer, learning the topics of Calculus at the same time as learning how to drive the computer algebra and graphing software LiveMath™. 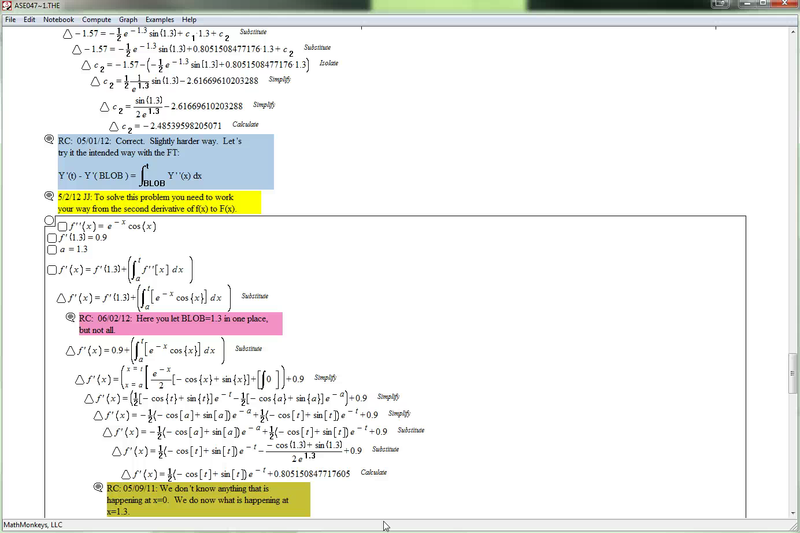 These LiveMath™ screencast videos make up the majority of the video presentations in the videotext. 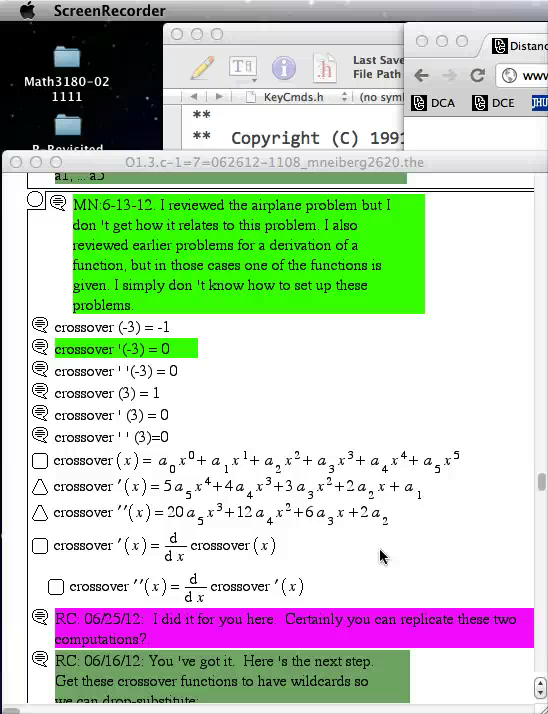 One extremely powerful aspect of the Distance Calculus course technologies is the usage of screencast video (and audio) recordings made by the students and the instructors, exchanged just as easily as emails back and forth. If a picture is worth a thousand words, then a screencast movie is worth a million words - and saves boatloads of time and effort. Instead of trying to type out a math question about a particular topic or homework question, the ease of "turning on the screen recorder" and talking and showing your question - in the span of a few minutes - can save hours of time trying to convert your question into a typed (and coherent) narrative question. When a student asks a question in a homework notebook, sometimes the best way to explain the answer is via a screen movie. We utilize easy-to-use software to create screen movies with audio so that you can communicate with your instructor "as if they were sitting at the computer with you". Students don't ask questions like this everytime they have a question, but it is a good way to ask questions after text chats aren't working. If a picture is worth a thousand words, and a movie is worth a thousand pictures, then a movie with audio is worth 1000*1000*1000 = 1,000,000,000 (billion) words! This screen video was created by a student in the Calculus II course, asking a question about a particular homework problem. This screen video was created by the instructor, answering the student's video question. The majority of course work occurs via the exchange of LiveMath™ notebooks - think Word Processing Files, but for mathematical computations instead of just text. The student will "Hand-In" a notebook, and one of the instructors will grade, correct, give feedback, and/or give hints on the work in the notebook, and return the notebook to the student in his/her "GetBack" folder, where the student will view the instructor comments. Sometimes the notebook is deemed "Complete" on the first revision. Sometimes the notebook must go back and forth between the student and instructor a number of times - 2, 3, 4, 5 times is rather common. Coupled with the screencast video mechanism, sometimes the instructor or the student will submit a screen movie with the notebook, giving further explanation or questions in audio/video format. Below are some example notebooks from actual students, showing the progression from starting notebook to completed notebook.